Inspired by his viewing of this painting in Paris in 1907, Russian composer Sergei Rachmaninov wrote the tone poem “Isle of the Dead” in 1909. “In both pictures [New York and Basel] the effect is that of evening. The sky and water are dark but the island and the figures are lit by a mysterious afterglow. The [New York] picture…which he finished for Madame Berna, later the Countess Oriola, with her taste in view was given a softer expression by increasing the flowers on the island of tombs; the other [Basel] was more austere and forbidding…. 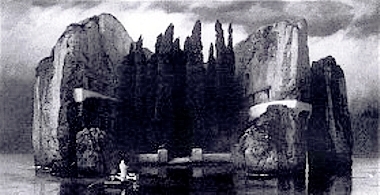 Bryson Burroughs, “The Island of the Dead by Arnold Böcklin,” The Metropolitan Museum of Art Bulletin, vol. 21, no. 6 (June 1926): 148. Leon Botstein, “Brahms and Nineteenth-Century Painting,” 19th-Century Music, vol. 14, no. 2 (Autumn 1990): 164.